As promised last week, today I’m coming back to the Loire Valley today. As I said in my earlier email we had no set plans as it seems most tourists do when in the Loire. On our second day we picked Château de Chenonceau. It’s the fairy tale like chateau that you’re most likely to see on postcards. Part of the castle is built over the River Cher. It’s set in a huge grounds with both forest and highly manicured gardens. It’s known as the Ladies’ Château because of the women who have lived there over the centuries. 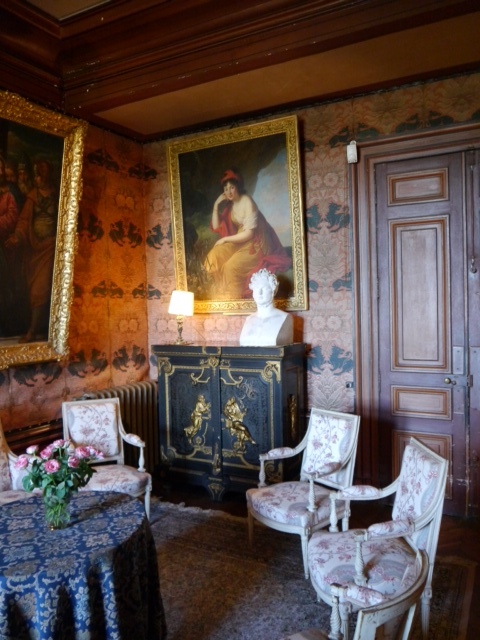 Since Diane de Poitiers in 1547, the chateau has been lived in, looked after, restored and cared for by several women. 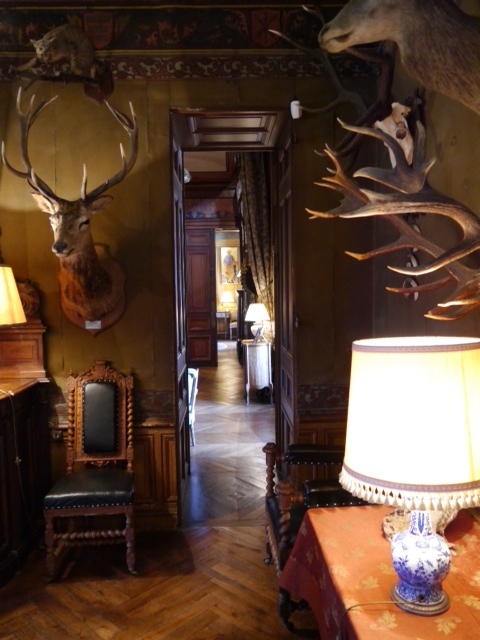 We really enjoyed our walk through the chateau. Most of the rooms are surprisingly small and intimate and beautifully decorated. Many of the walls are covered in very old tapestries and paintings from Renaissance times. The each room is bought alive by gorgeous bowls of fresh flowers. 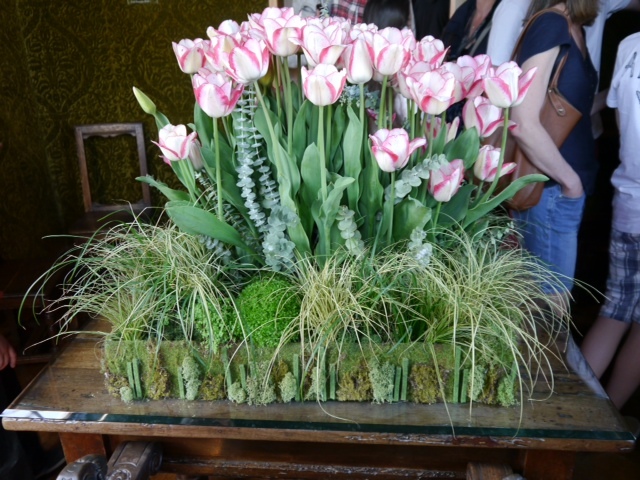 The chateau gardeners grow as many of the flowers as they can for the in-house florists to use. 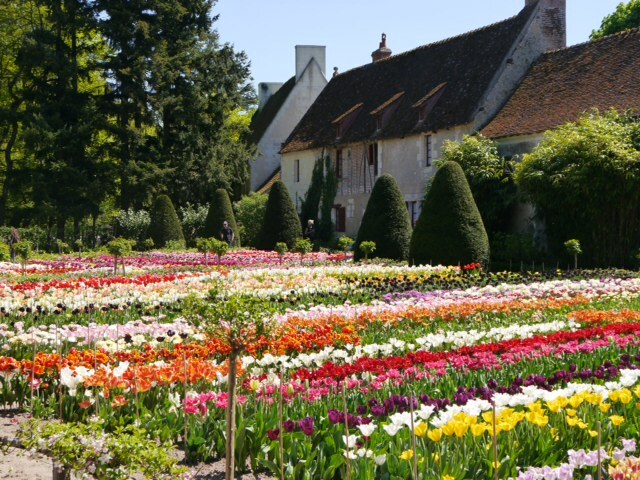 The huge tulip beds were right at their best when we were there. 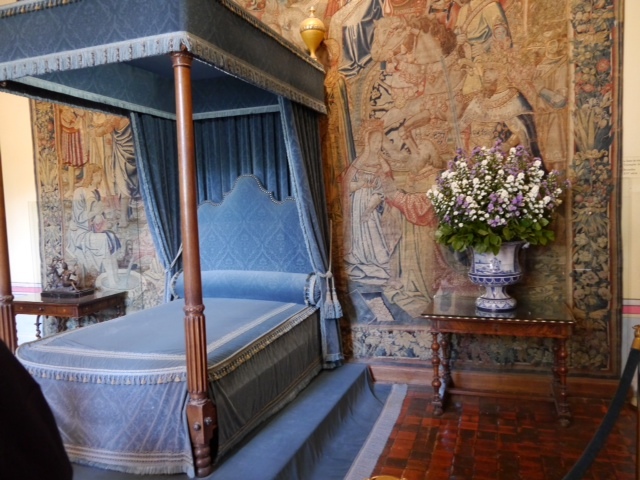 The most unusual room is Louise of Lorraine’s bedroom as its all black and painted with objects of mourning. 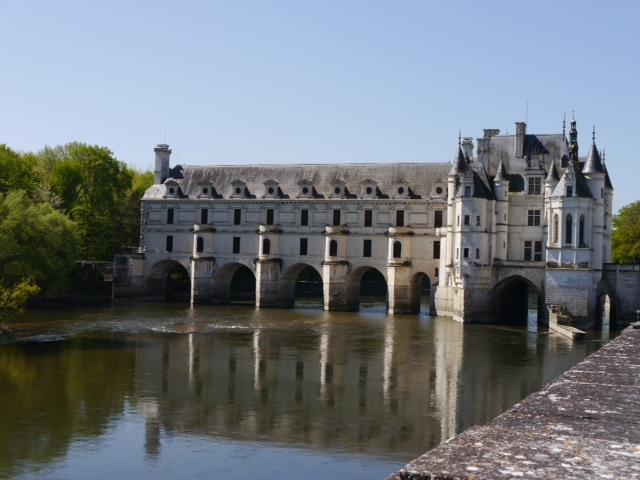 After her husband King Henri III was assassinated she retired to Chenonceau, dressed herself in white and spent the rest of her life there meditating and praying. 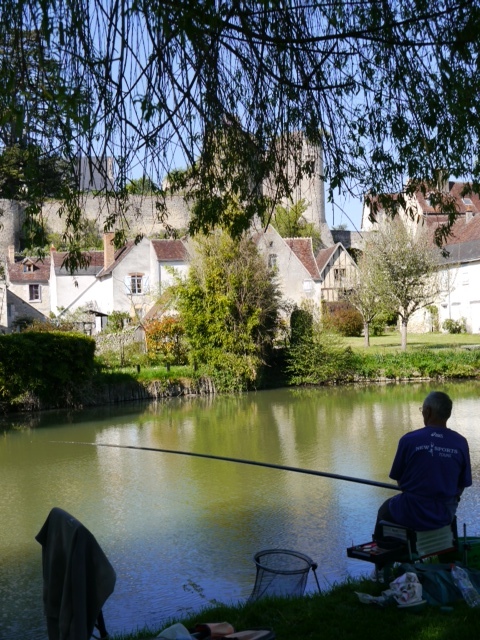 After the grandeur of Chenonceau and feeling that another chateau would be too much that day, in the afternoon we decided on a late lunch at the village of Montrésor, called one of the most beautiful villages in France. It turned out that there was only one place open to eat at but it was far too late for lunch. The waitress very kindly suggested a cheese platter – five local cheeses for €5. A bargain. 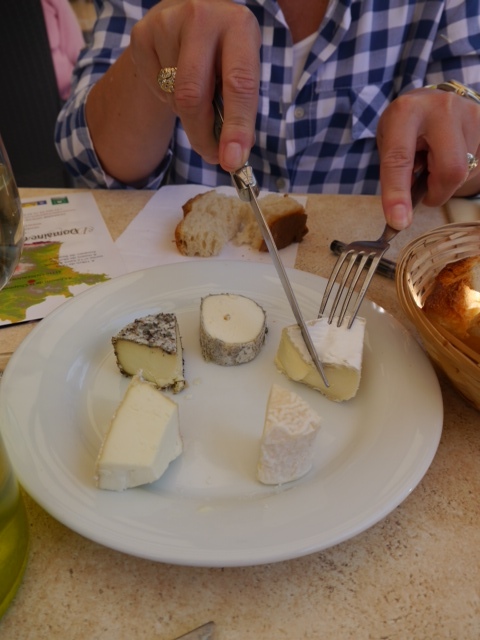 The Loire Valley is renowned for its goats’ cheeses – these were delicious. We ordered a glass of red wine each but she said no we should follow her recommendation and have a glass of the local white chenin blanc. It worked perfectly with the cheese. After our snack we wandered through the village and along the banks of the River Indrois where you pass an old water mill and village lavoir (wash house). No one was around except a fisherman quietly wiling away the afternoon. 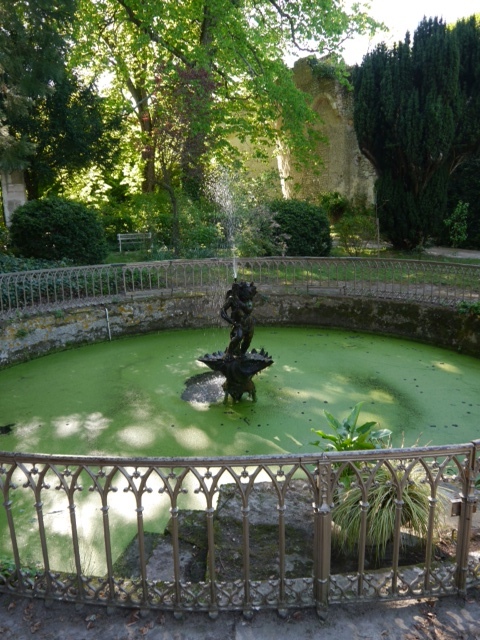 Overlooking the village is the Château de Montrésor – a medieval castle with a Renaissance mansion in the grounds. We found ourselves near the gate. It was deserted. I went to see if we could go into the grounds and was approached by an elderly gentleman. I couldn’t say no and ended up buying entrance tickets from him even though it was after five by then. We found that the chateau has been owned by a Polish family since 1849 when it was bought by Xavier Branicki a wealthy Polish count and friend of Napoleon III. He had the castle completely restored. The gentleman selling tickets at the gate is the current Count. 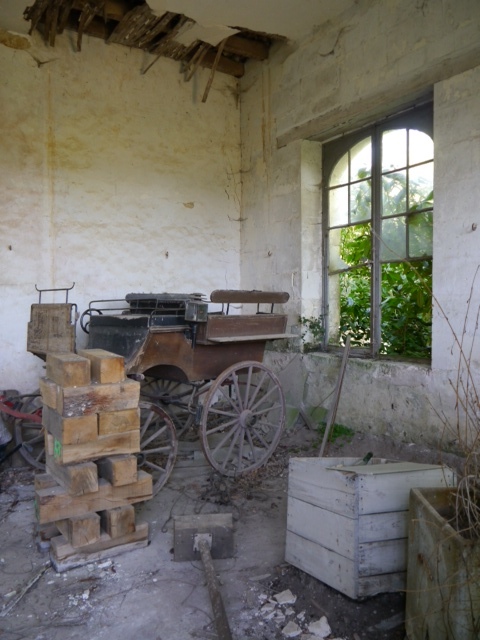 He explained that the house has been left exactly as it was in 1860. We were the only ones there. It felt very eerie and a bit as though Count Dracula might appear at any moment. It’s amazing though. 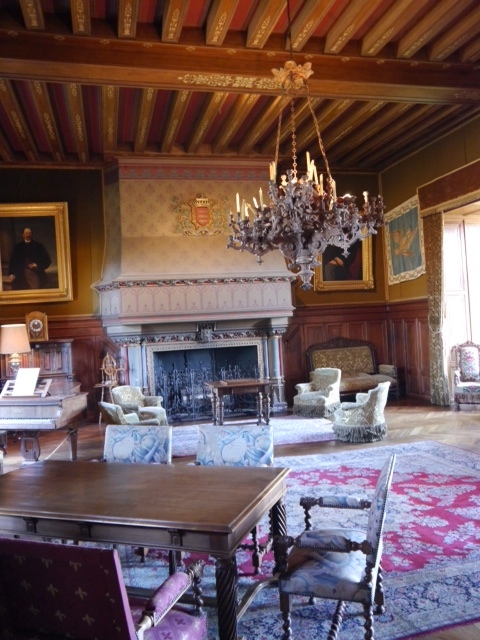 We thoroughly enjoyed our exploration of the rooms armed with a very good guide book that the Count lent us. 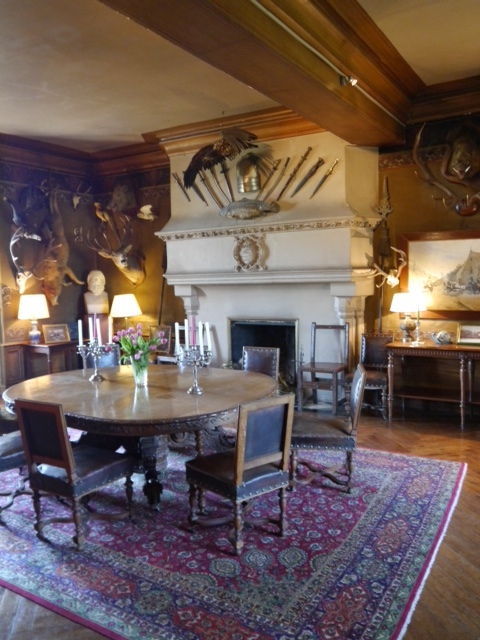 There are mementoes of the original Count’s military career as well as a room devoted to his hunting trophies. 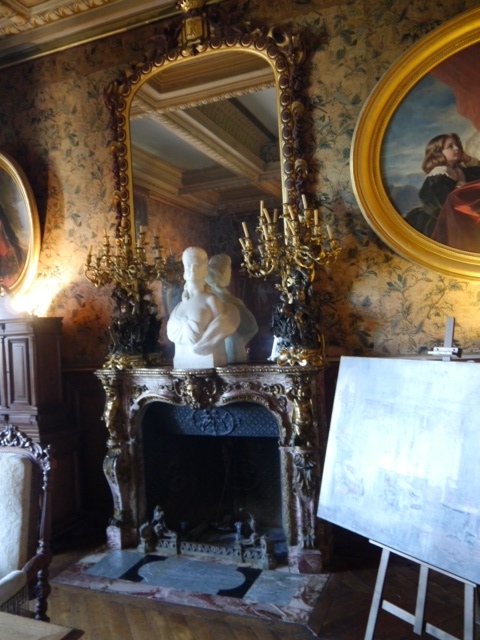 Many old French and Polish paintings cover the walls. It feels like a large country home. Such a contrast to Chenonceau!! Unfortunately it feels as though it’s a forgotten place as it’s quite a small chateau amongst the many large grand ones that most tourists stick to. 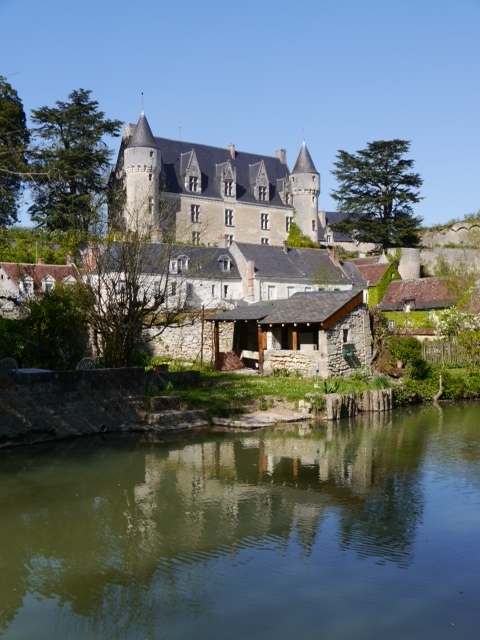 If you like getting off the beaten track definitely visit Montrésor.